Being completely honest, the next game I’m going over, I had never even heard of until my husband mentioned it. Not just once- but over and over. Part of me was interested because he said I would really like it, and part of me was interested because it brought up exactly the reason I started this blog in the first place. It’s allowing me to share my gaming experiences with old consoles and games people may not see otherwise. Anyone here heard of a game called Whomp ‘Em? Well, now you will. 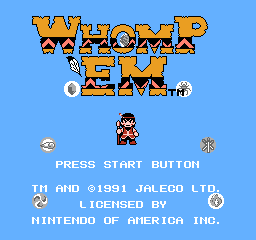 Whomp ‘Em (a ch arming play on the term ‘wampum’, a form of currency for Native Americans) begins with the player taking control of young Soaring Eagle, a Native American himself who is on a quest to collect the totems of his people for his magic pouch. He travels through various lands including forests, volcanoes, and oceans in six ‘rituals’ to gather these totems, each of which gives him a new power. 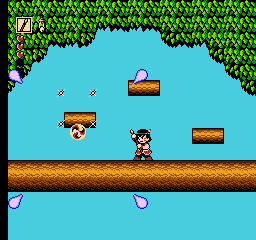 As the game progresses, the player can receive power-ups which will give Soaring Eagle more protection, refill any lost life, or even extend his life meter. Fighting creatures along the way, Soaring Eagle does not know what lies in wait for him at the end of his journey. If the game’s plot sounds sparse, it kind of is. The manual doesn’t go into nearly as much detail as the above paragraph does, but there isn’t much to go into. It’s almost a coming of age story without all of the corny one-liners and very special episodes. The gathering of powers may also sound like a rip off of a certain popular Nintendo game, but this game is actually a Westernization of a Japanese game and not of said game. The point to take from this is while the game isn’t making any strides for gaming mechanics, it does have one thing going for it. It has notoriety for being the first game to feature a Native American in a starring role, a feature that has not been replicated often, even today. The mechanics of the game are also simple. Run, jump, and attack are your main methods of getting through. Most of the powers seem neat when you get them, but against enemies and in actual progress through the game, I didn’t notice much of an effect. In fact, most of the powers, I didn’t even use until the final stage- which I do have to add is one of the best final stages in an early-era game I’ve played in my memory. What surprised me was that the game does have some kinds of role-playing elements. As you travel and defeat creatures, they drop gourds. The gourds are akin to experience points, as when you earn enough, your health meter grows a heart longer. It was the one thing that really differentiated Whomp ‘Em from other platformers of the era. Another thing to mention is that Whomp ‘Em has some scattershot difficulty in areas. I may have been playing it wrong, but those powers that should have worked on certain bosses were about as effective as the swearing that resulted when poor Soaring Eagle died because of my misguided attempts. I know I’ve harped on the powers being ineffective already, but I found myself sticking to the default spear in almost all cases, which may have resulted in a harder game. 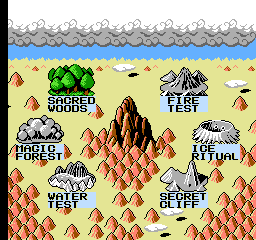 Even being guided on exactly what power to use where, there were bosses that were incredibly difficult because of this problem, and there were areas that were incredible easy in any case. There were minute frustrations throughout the game from this, but nothing that would result in tearing it down too much. Thankfully, the game is relatively short, as well, considering there is no way to continue from the spot that you died at once you lose your lives. That’s another point against the game, as usually, I don’t have the time to sit and play through an entire game in one sitting. As much as I want to say I loved the entire game’s front end, I did have my issues. The music ranged from incredible- especially for the time- to downright grating. The Magic Forest’s theme comes to mind, as I remember enjoying it for the first few minutes, and then realized it was pretty much the same three notes over and over again. The sound effects were above par, as they sounded like they should and sounded good. The graphics, though, I really enjoyed. The game is not visually innovative, but a lot of the bosses and level designs are interesting and detailed- though they will call to mind Mega Man entries and levels at points. Animations are smooth and the monsters all have interesting designs, too. Again, the entire last level (and boss) are a lot of fun to look at, and the palette runs the gamut of colors, bright and dark. 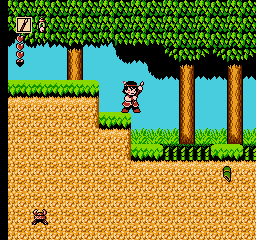 The visuals come only second to the role-pla ying elements as far as the boons to this game are concerned. Having this game recommended to me was a bit of a blessing, as I had never heard of this game before it was presented to me, and I am glad that I experienced it, for better or worse. It was a fun piece of video game history and it is a solid game that can hold water, even today. Not all recommendations end up being as positive as this one, and while I may have my own issues about the game and how it presents some of its features (or ignores them completely), I’d say Whomp ‘Em is a nice distraction if you want a good example of the Nintendo library’s highs and lows. Seriously. It’s not often that I find a game I had absolutely no idea about before on NES, but this one took me by surprise. Glad to hear it sounds like you’ve heard of/played it!